Hosta Sum and Substance is a giant growing hosta. Growing in the 3 to 6 foot tall range, the Sum and Substance spreads approximately 6 to 10 feet wide. It's giant heart shaped blue green leaves are a strong backdrop for the lilac to white flowering spikes that pop up from July to August. 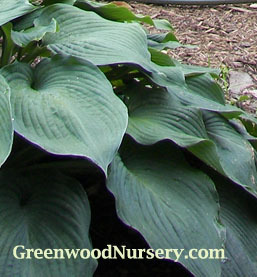 The Sum and Substance Hosta was selected Hosta of the Year 2004 by the American Hosta Growers Association. Though it is noted as growing in full sun to part shade, we have noticed in our own Greenwood Nursery Garden, that it gets a little edge burn when exposed to the hot summer late afternoon sun. A thick layer of finely shredded bark mulch or aged compost mix will help to keep the ground cool, around your Hosta Sum and Substance, and moist for sunnier spots. Drought tolerant once established. As with most, this giant hosta should be divided every 3 to 5 years.